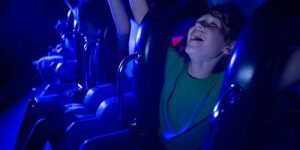 Today is Six Flags Announcement Day! So let’s introduce the new ride to Six Flags New England! Step into S.T.A.R. Labs to witness a new technological device when the sentient cybernetic system called THE GRID hacks into the mainframe and takes control of the entire lab. A high-tech thrill ride with 360 degrees of lifting, tilting, and spinning. This is pure heart-pounding high-speed adrenaline! 24 riders will get up-close views of S.T.A.R. 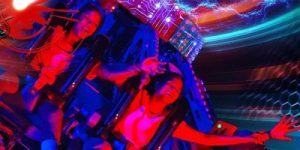 Labs as you sit outward facing during this action-packed ride experience. 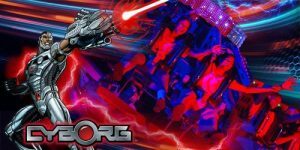 CYBORG™ quickly accelerates faster and faster reaching maximum speeds while whirling guests through seemingly endless rotations of spinning insanity. Experience state-of-the-art lighting and sound effects. CYBORG thrills with an immersive and thrilling 360-degree experience. I Can’t wait to find out more about this ride and see it’s location, which we are suspecting the Justice League Building as it used to house the Jokers Wild Card years ago! 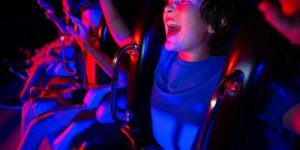 Let us know what you think about this new attraction coming to Six Flags New England! Do you like it? Do you hate it? Voice your opinion below! Make sure to tune into SFNEOnline’s Grove Show tonight at 8:30 PM Eastern time as we talk about all of the Six Flags Announcements! Join the conversation and let us know during the live show what you think about all the announcements and more! Head to the link below and make sure to subscribe and share so we can continue to grow SFNEOnline’s YOUTUBE PAGE!